Last week Liv-ex reported that second wines are rapidly catching up to their Firsts in terms of price ratio, and that in July 2007 it was possible, on average, to buy 6.6 bottles of second wine for every bottle of Grand Vin. This number has now more than halved, currently standing at 2.73. 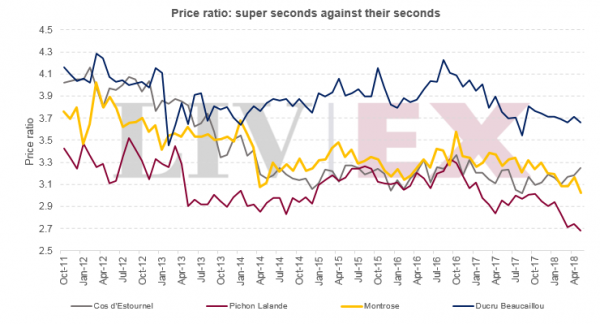 Now the platform has examined the relationship between the ‘Super Seconds’ and their second wines, and has found a similar pattern. While none of their ratios are as tight as Mouton’s, Lafite’s or Margaux’s, the ratios of have tightened from October 2016 to record lows of 2.7, 3 and 3.7 respectively. As Liv-ex notes, though, not all second wines are becoming more expensive relative to their Grand Vin. The price growth of Cos d’Estournel, for example, has outpaced Pagodes Cos in the last year. As such one can now buy 3.3 bottles of Pagodes for every bottle of Cos d’Estournel, compared to three bottles this time last year.